« Was the Tailbone even included in the Tailbone Imaging studies? For people who have the worst pain while they are making the transition from sitting to standing, this is often due to unstable joints at the tailbone (coccygeal dynamic instability). Basically, a fall or other trauma can injure the ligaments that would normally hold the individual bones of the coccyx in a normal and stable alignment. When those ligaments are no longer functioning properly (due to sudden, traumatic injury, or sometimes even just from gradual loosening over the years), one or more of the joints of the tailbone can become unstable. Sitting puts body weight/pressure on the joints, often causing a partial dislocation. When someone stands up suddenly, the body weight/pressure is removed and the tailbone may “snap” back into a more normal alignment. That transition/snap is often VERY painful for patients. After those few moments of worsened pain during the transition from sitting-to-standing, many patients find that their pain is better for a while (while they are standing or walking), only to return again the next time they sit down. Unstable joints of the tailbone can only be diagnosed by having x-rays done while you are sitting and then comparing those images with the position of your coccyx while you are standing. Unfortunately, very few radiology centers perform coccyx x-rays while you are sitting. 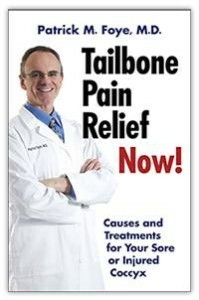 This causes many patients to suffer in pain while the cause remains unrecognized. Hi Patrick, I’ve been experiencing this exact pain after a 60 ft cliff jump 2 days ago. I’m currently overseas and would like to wait until I’m back in the USA to get this x-rayed, but I’m wondering how long this pain usually lasts and if it’s a spontaneous healing or if treatment is required. Thanks for your input. Yikes! I can totally understand how jumping off a 60 foot cliff could cause tailbone pain (and lots of other injuries!). 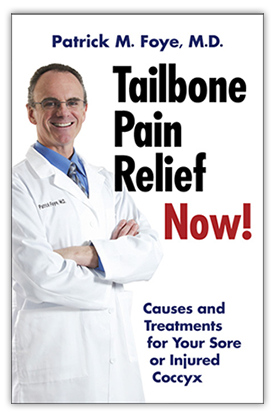 It is highly variable how long the pain lasts for tailbone injuries. Some patients have pain lasting just a few minutes and for other patients the pain lasts for many decades.